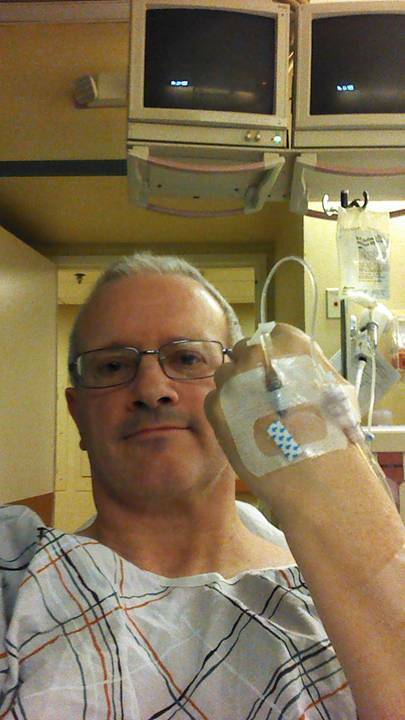 was about to happen after a follow up visit with Dr. David a month later on February 20. 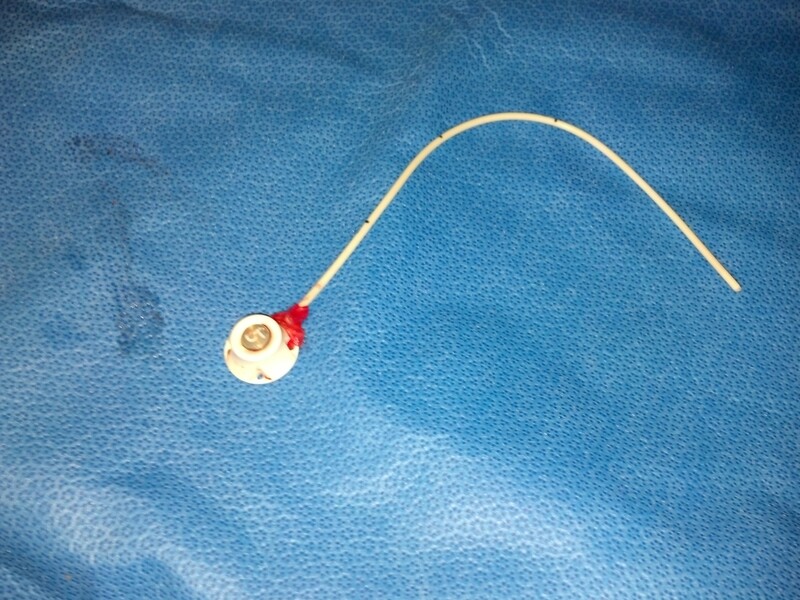 “Let’s get that port out of ya”, he said and we made the appointment for the following Thursday, February 27. Back around the time of chemo session #3 or #4, I had discussed with Dr. David about my getting a survivor tattoo when this was all done. I wanted his thoughts on when he thought would be a good optimal time when I wouldn’t be at risk for infection and together we had decided on around March and here with a week left in February, that was pretty good timing. So, after we left his office that day with my port removal appointment all set up, we headed over to the tattoo parlor and the date for that was set for the day after the port came out. I was told I’d have to fast for the port procedure and of course that was a bummer, but then I got a phone call from the hospital the day before and the woman on the other end of the line said that if I was going to be put under I’d have to fast, but since I elected to go with just a local anesthesia, like I had when it was installed, I was good to go. I could eat. Yay! It was the same team as before and they all remembered me, especially the poor nurse who suffered my insane screams of pain six months prior. 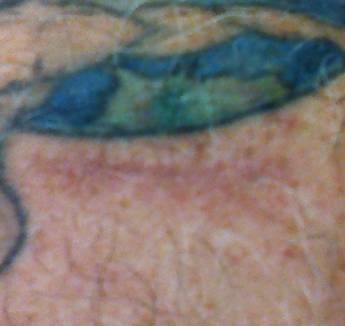 And they were all astounded by how cleanly the incision had healed, even the surgeon, who recognized my Atlas tattoo. They got me set up like before. This is an IV just before they laid me down and covered me with surgical paper over my head, tented on the opposite side for ventilation, slathered some green-blue antiseptic stuff all up and down my chest and neck and numbed me up. All was the same except now I was actually, for lack of a better word, enjoying this experience. The nurse and I talked again how she knew the girl who lived in my house, whose father built it way back in 1954 and the surgeon told me he lives just across the river from me. It was a fun bonding moment that went no further than the operating room. It seemed like an eternity to get the port out, I kept hearing chatter like, “No, cut from this side”, “I think I have to go at it from this angle” and the like. Oh great, a novice port remover person. And squeezing and pulling and pressure. “You still with us, Mr. Sigley?”. Then it seemed an equally long passage of time when they were closing me up and for the amount of time he was working on stitching me up, I half expected to have an embroidery sampler on my chest. They allowed me to take a picture or two of the port (which I showed you at the beginning of this series) but I wasn’t allowed to bring it home as I hoped I could because it had tissue on it and for sanitary reasons I had to leave it behind. Alas! There was a spirited debate over it, between all involved, though. Now all that was left was to get taken back to the “recovery” room where my clothes were and to have the rather enjoyable turkey sandwich box lunch they had ready for me. I had intended on stopping for a pork roll and cheese sandwich on the way home, but they wouldn’t let me leave until they saw that I had eaten and by then I wasn’t hungry for pork roll and cheese. And one of my fellow chemo patients from Dr. David’s was just coming in to have her port removed and she pointed out that I was the one who always brought food in during chemo sessions. At the tattoo parlor the next day, I had an interesting conversation with the girl who did my work. Turns out, she lived in my old neighborhood and is friends with the daughter of the people that moved into our house in 1985. And she knows the kids of the kids I grew up with. We talked about some of the neighbors that no longer live there and some that are and decided that in every neighborhood there is at least one “witch” and in this case, we had “witches” for different sections of our street. It was a fun afternoon. Dinner, of course, was the obligatory stop at Outback Steakhouse close by, our tradition whenever we get new ink. I had the weekend to recover from both assaults. I see the scar on my chest on a daily basis and I rub a finger across it. 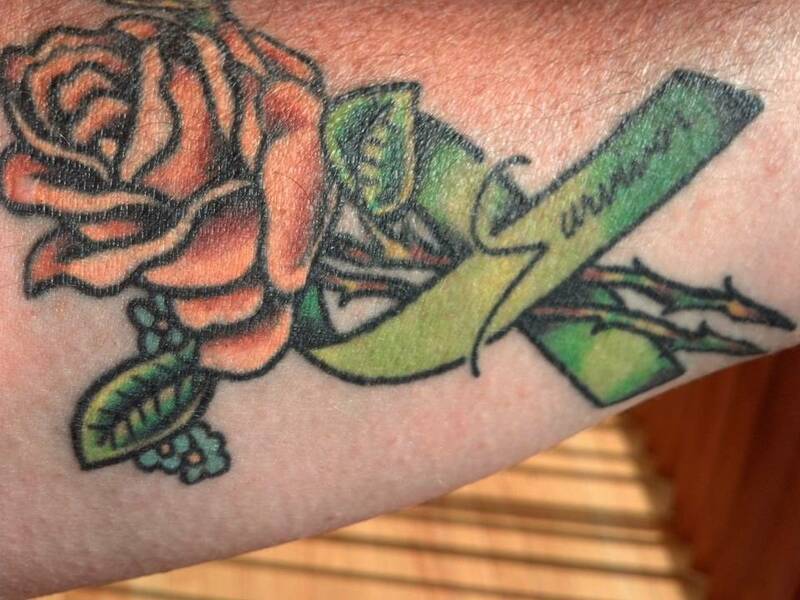 And of course, the green ribbon survivor tattoo on my forearm is out there for the world to see and at least once a day run my hand over it. These are my battle scars, reminders of how lucky I was and a smile comes across my face. These days that smile is not as hesitant as a few short months ago. They are reminders, also, that my case, by comparison to what some other people go through, was like a cake walk, but it was still my own hell, my own battle. As I caress those two scars, never mind the emotional scars in my mind, it brings back the sounds of my first cries when I heard the words “you better get yourself an oncologist” over the phone, to the sounds and smells of the hospital. They remind me also of the feelings of sickness and pain and the thoughts of giving up and letting go. And there were the uncertain times such as not knowing whether the cancer was really being wiped out or whether I’d live to see another vegetable garden. I am reminded also through my battle scars that I had a great support team; my family, my friends, my doctors and nurses. Words cannot express the gratitude I feel for each and every one of them. And then there is Ariel. I don’t know what my experience would have been like without him by my side, and thankfully I don’t have to wonder about that. I told him one day while I was in the hospital that I wasn’t going to let him live out the rest of our lives without me. And here I am. And I don’t take that for granted. I wear my battle scars proudly. And, oh, how I also detest them. This past weekend I had an eye exam and upon asking how my general health was, I discussed with my eye doctor that since my last visit with her, nearly a year to the day (and really about a month and a half afterward) I was diagnosed with lymphoma and was now in remission. Out of curiosity, she asked if I’d ever had mononucleosis. I did, more than 25 years ago. She mentioned how she’d read there is a correlation between mono and lymphoma cases so, later, after my exam, I looked it up. Some articles say yes, some say not so much, but still… something to think about. By the way, my eyesight also improved slightly, I didn’t need as strong an Rx as I’ve been having in the past. I don’t recall if there was a spot on any questionnaire I filled out during all that about previous illnesses and if there were, mono was never on my mind and certainly I was never asked otherwise I would have said so. I definitely will bring this up with Dr. David next time and see what he has to say about it. In the meantime, here are two of the articles I found on the link between momo and lymphoma. Article 1 and Article 2.